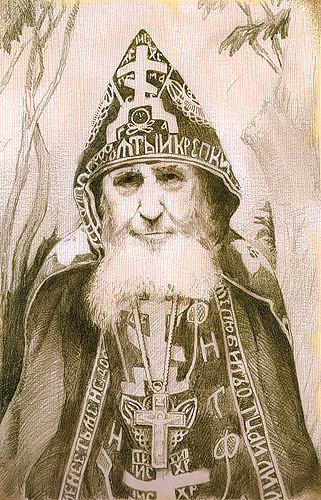 Schema-Archimandrite Andronik (in the world Alexei Andreyevich Lukash), a venerable elder and great man of prayer, was born February 12, 1880 in the village of Lupa, in the Romen region of Poltava province, to a peasant family. In 1895 Alexei came to Glinsk Hermitage with the desire to dedicate his life to God. In 1915 he was enlisted in the army. First he served in Perm, but was soon transferred to the front, where he was taken prisoner by the Austrians, and remained in Austria for three and a half years. The prisoners were hardly fed, and given the most difficult labor. Many prisoners died of hunger and labors beyond their strength. But Alexei prayed intensely and accepted all these afflictions as from the hand of God. In 1918 he returned to the monastery, where he received the monastic tonsure in 1921 with the name Andronik. After the monastery was closed, he worked at a mill in the town of Putivl. Monk Andronik's strict monastic life and unmurmuring obedience drew the attention of Bishop Pavlin (Kroshechnik), a vicar of Kursk, who received him as his cell attendant. But Fr. Andronik was arrested and exiled. When he was released on amnesty, he again became Bishop Pavlin's cell attendant. In July of 1930, Fr. Andronik was arrested in Kaluga and sentenced to five years of imprisonment. In exile, Fr. Andronik worked as a nursing aide in a prison hospital. He looked after the sick with sincere compassion and love, washing them himself. Everyone loved him; the Uzbek prisoners even called him "mama." In 1939, Fr. Andronik was again sentenced and sent to Kolyma. First, they detained him for eleven months in the prison, where he was interrogated every night, being pressured to slander Bishop Pavlin, but the elder kept silence. In the prison cell, Fr. Andronik had a vision of a certain Lady, who consoled and encouraged him. At first, he thought that this was his mother, but only later understood that she was the Mother of God. Having completed his prison term, in 1948 Fr. Andronik returned to Glinsk Hermitage and was appointed dean of the monastery. It was his duty to watch after everyone in the monastery, gather the brothers to cut hay, prepare firewood, and work in the garden; he was always the first to do these labors. Fr. Andronik's soul, purified by many sorrows, was filled with the gifts of grace. This bearing of the spirit attracted people to the elder. Having magnanimously endured all suffering, he fulfilled the commandment to love thine enemies in deed. Humility and meekness reigned inseparably in his soul; the elder even walked bowed in humility. After the monastery was again closed in 1961, Fr. Andronik moved to Tbilisi under the direct care of the former abbot of Glinsk Monastery, Metropolitan Zenobius (Mazhugi) of Tetritskaroi, who greatly loved and respected the elder. Just as they did to Glinsk, now people came to Fr. Andronik in Georgia from all over the Soviet Union seeking salvation. His whole life was directed at one goal—the salvation of his soul and the souls of his neighbors. On March 21, 1978, having reached deep old age, he gave his spirit to God.